In Mad Magazine, the two nutty spies would try to outdo each other each episode, but you always got the sense they were just two sides of the same character. This week, I have been thinking of Bella Vs. Bella. 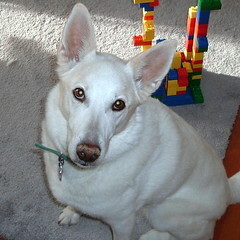 As some of my regular readers know, we had to put our old dog, Bella, down at the end of last year. She was my very first dog, and good dog for the most part, and that is her picture that you see as my avatar (in case you ever wondered why I have a dog head for my avatar — plus, my nickname is Dog before ‘Dawg’ was slang). I figured the use of her image would be a nice way for me to remember her. Bella has been on my brain because we have been dog-sitting a friend’s dog this long Memorial Dat weekend whose name, get ready, is … Bella. And so, I take this Slice to compare and contrast the two Bellas in a fun exercise of reflection and rememberance. There are no winners in this game, except for us. We loved having the visiting Bella here, although her large size and goofiness put her right in our path wherever we went. We could barely get in the house when we came back home as her big body just filled the doorway. This entry was posted in Homepage, Slice of Life and tagged sliceoflife. Bookmark the permalink. Great comparison. I love your descriptions of the visiting Bella, and the image of her always being underfoot. So when do you get an heir to Bella? I was sure this would be your new dog, Bella 2. But knowing you, a new member in the family would be a perfect opportunity to collectively select a new name…a name challenge. This is charming. My kids would love to have visiting Quincy and Shelby dogs now that their pets have passed away. I dare not share you idea with them. This is delightful. Both Bellas look adorable and adoring … but I have to say, there’s something in the original Bella’s eyes that win my heart. You can just see what a lovely dog she was. 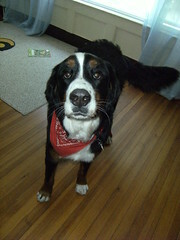 I love Bernese Mountain dogs, though. They are so … what I like to call ‘galumphy’ all the time. Very nice. They remind me a little of the New Foundland we had when I was a teenager. Great compare/contrast! Lol, “visiting” Bella: kind of dimwitted”. We love our own dogs best in the end! Both Bellas look lovely. Now, I must go back to considering the addition of a third whippet to our pack. Our dog had to be put down a few years ago when he flipped out and tried to attack our son, who was about 18 months then (he’s almost four now). My husband tried to calm him down and ended up with a severely torn-up hand. His name was Killer, ironically, but he was very sweet until that point. He was about three pounds, a miniature Chihuahua, and the first little dog I ever liked. Wow, Jo, sorry about that. That is a sad story and one to keep in mind when you mix dogs and kids (we certainly have that in mind as we consider someday getting another dog). The country and the ability to run is a good setting for a dog, I’d say. Yes, I’ve never really liked the idea of tying up or fencing in an animal. Maybe that’s because I spent my formative years on a 100-acre farm, but I’ve lived in the city for the past twenty years and had grown used to it, I suppose. The move was tedious, to say the least. We survived it, though I still feel as though I’m recovering from it. :O Thanks for asking.